Take your productivity and accuracy to new levels by spending less time on process and more time on discoveries. The Biomek 4000 offers powerful and intelligent liquid handling that adapts to changing situations. 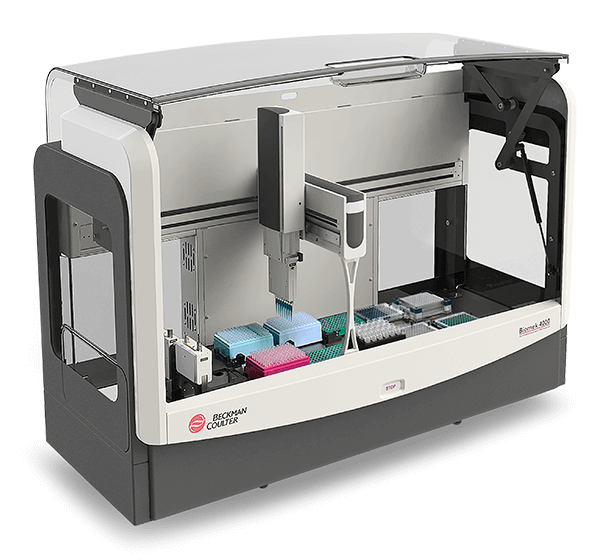 From its easy-to-use-icon-driven software and available application methods to its enhanced work surface with interchangeable tools, the Biomek 4000 helps you streamline your workflow and automate your laboratory. Package includes Biomek 4000 Laboratory Automated Workstation with enclosure, software version 4.0 with Windows 7 Automation Controller, monitor and mouse, PCR set-up method software, P200L single-channel pipette tool with LLS (Capacity 5ul-200uL), MP20 eight- channel pipette tool (Capacity 1ul-20uL), Accu Frame autoframing tool, 6 tip rack holders, 6 labware holders, 1 tool holder, large disposal to discard tips, left side and right side extension modules, left Side offDeck mount with offDeck tool holder and framing adapter and a starter kit with assorted BCI Labware. Includes basic on-site training, basic application support and complete system installation.